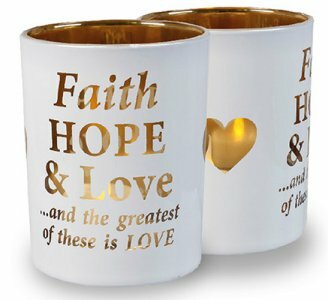 DIVINE CHRISTIAN GIFTS - Faith, Hope & Love - Glass Votive Light Holder. Faith, Hope & Love - Glass Votive Light Holder. Glass votive light holder with gold effect interior and tea light. Size : 3 3/4" x 3" Dia and comes boxed.